1. Make the Mango Citrus Salsa by combining all ingredients except swordfish, oil, salt and pepper in a medium bowl. 2. Mix well and set aside to let flavors blend. 3. Brush swordfish steaks with olive oil then season with salt and pepper to taste. Grill steaks over medium-high heat for 4 min. per side or until cooked through. 4. 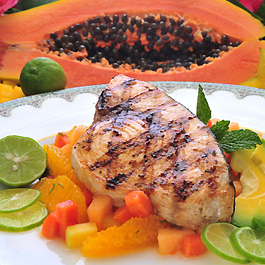 To serve, spoon the Mango Citrus Salsa over the swordfish steaks and garnish with mint sprigs.